Each week, I select something to cook from one of my many recipe books to get through all of the recipes I want to try. For this week's edition of What's Cooking Wednesday, I decided to turn to my favourite baking book- Simply Heaven-Chocolate. I got this book for free when I bought lots of chocolate at the supermarket, and it has been indispensable for experimenting with chocolate. I got my son to look through and see if there was anything that took his fancy. 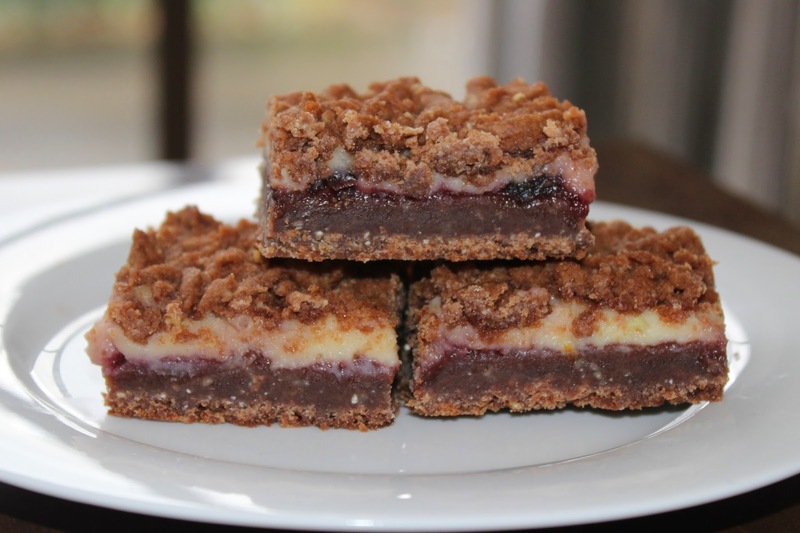 I was going out, and had to bring some nibbles, and the request was for chocolate, so we ended up settling on the Cherry Almond Crumble Slice. I ended up deviating from the recipe and using some brandy soaked cherries, but you could easily use standard jarred cherries, or fresh cherries when they are in season. recipe adapted from Simply Heaven-Chocolate. Combine the flour, brown sugar, almonds, cocoa, cinnamon and butter in a food processor and process until the mixture is crumbly. Press three quarters of this mixture into a slice tin. Form the remaining mixture into a ball, wrap and chill for 30 minutes. Bake the base for 20 minutes in a 180 degrees C oven. Cool, then spread with the cherry jam and lay the cherries over the top. Beat the cream cheese with the sugar and orange zest until smooth, then spread over the prepared base. Coarsely grate the remaining chilled dough over the top. Bake for a further 40-45 minutes. Cool completely in the pan then slice and serve. The verdict- Delicious! The filling was creamy, the chocolate and cherries combined so well, and the crumble of the topping was really enjoyable. I am definitely making this again when cherries are in season! Linking up with Wake Up Wednesdays. My husband loves anything with cherries, he'd love this!